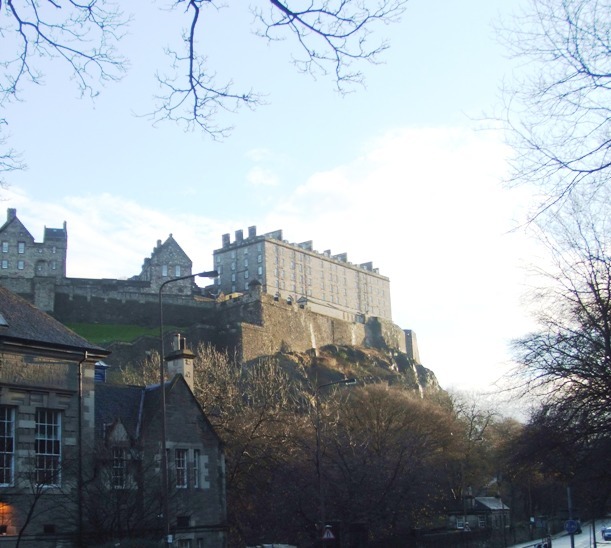 Edinburgh is dominated by the castle perched high and brooding over a great rock where people have defended their communities for thousands of years. 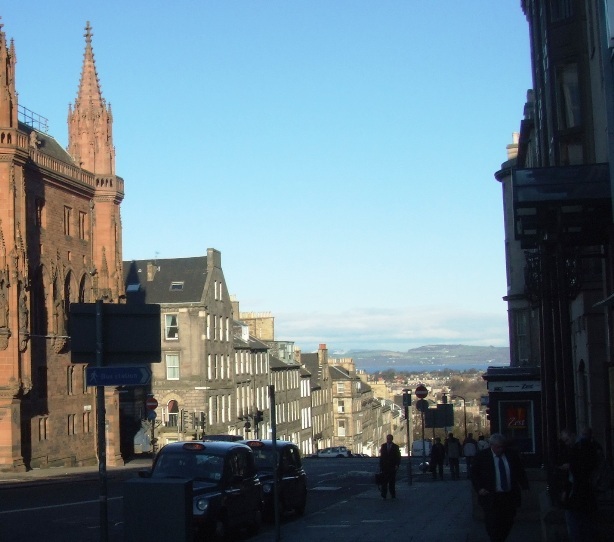 It towers over the medieval Grassmarket, the place of executions, its cobbled frontage home to pubs and restaurants and aiming to become a continental-style piazza for the globally-warmed 21st century. Victoria Street curves quaintly and steeply back up to the Royal Mile, Edinburgh's ancient High Street leading from the castle gate down to Holyrood Palace. Another dominant aspect of Edinburgh is the presence of the sea, from the Firth of Forth around through Cramond, Leith and Portobello across to the former fishing villages as far as North Berwick. The sea is visible from surprising places, some very near to Princes Street. In the other direction, Arthur's seat - a retired volcano - and the ranges of the Pentland Hills enclose the city within its own amphitheatre. This variety of views and a certain compactness gives Edinburgh a rightness of proportion. Not too large, nor crowded with tall glass towers, but equally, not too small as to preclude an interesting range of locations and perspectives. The immediate impression of the city is that of stone, the stone of the castle rock and of the old and new towns. The old town, leading from and around the castle and the new town on the other side of Princes Street. The former, with its closes and tenements recalling the medieval city; the latter, the Georgian streets of the newer city, a kind of Northern Bath. But the stone is darker, harder and not as golden as that of Bath, except, perhaps on days of sunshine when the stone glows in a complexity of colours. Sunshine makes a big difference to the appearance and mood of Edinburgh. In its absence on cloudy and rainy days, the damp greyness gives a dour feel that matches stereotypes of the Scottish character. Coversely, when the sun shines, the blue of sea and sky, and the green of the surrounding hills gives 'Old Reekie' an invigorating warmth that cheers the most depressed soul. 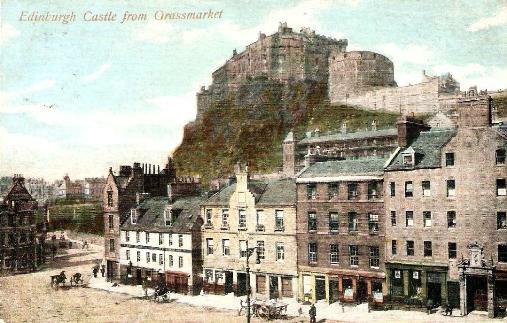 The castle looms across the gardens, sited on a drained loch, towards the commercial mishmash of Princes Street. The street, once a magnificent parade, is lined with discordant shopfronts and recovering from the preparation work for the city's new tram line. Princes Street is the main shopping area in the new town of Edinburgh. 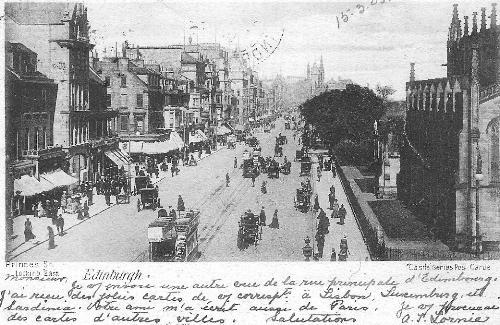 In many ways it has lost the charm of this view taken over a hundred years ago as modern frontages compete ungracefully along its length. Holyrood Palace broods at the bottom of the Royal Mile. 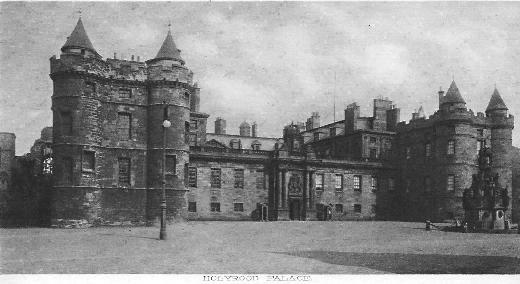 It was the Edinburgh home of the Stuart monarchs before James VI became James I of Great Britain and flitted to London. Today, the modern Scottish Parliament building, a Catalonian creation incongruous but impressive in its northern setting, stands opposite in a totally contrasting modern architectural style. Once a year it houses the Festival of Politics when the general public can sit in the legislative chamber and committee rooms to hear veteran politicians and more junior axe-grinders discuss their concerns. Edinburgh has many festivals - too many say some of the inhabitants - when culture-seekers from around the globe come to sample films, plays, comedy and music. From July through to early September the city heaves with visitors. Outside that period, the inhabitants return to the centre to find a more relaxed but still fascinating city while restaurants and tourist-related business owners wonder if they will earn enough to survive through to the next crowded festival season.